Arrowhead Nordic Ski Club, with the help of our sponsors, Arrowhead Provincial Park, and many volunteers, welcomes you back! Whether you are a racer, recreational skier, or fitness enthusiast, why not take the opportunity to enjoy the scenic beauty of Arrowhead in its winter splendour. We hope to see you here! 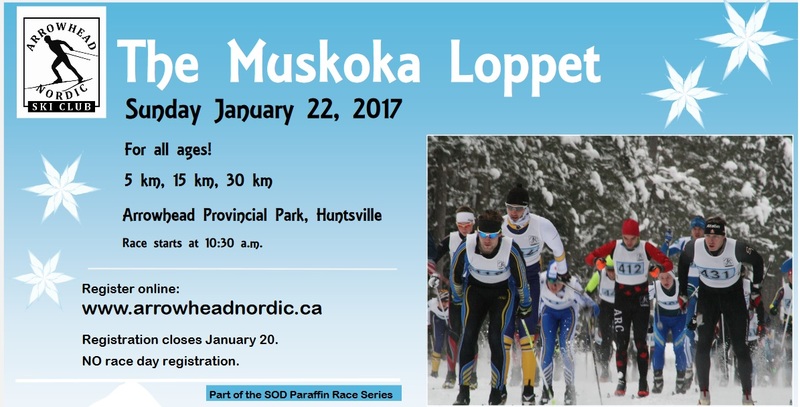 Registration: Register online at www.arrowheadnordic.ca – register online, by mail, or in person on race day. Register before Sunday, January 15, 2017, 11:59 pm for early bird prices. Online registration closes at 11:59 pm, Friday, January 20, 2017. New: Please note that you can NOT register on race day this year. Everyone must register before Friday, Jan 20. Bibs must be picked up by 9:30 am on race day.